Model T Ford Forum: So you think you know your tire pressure! So you think you know your tire pressure! 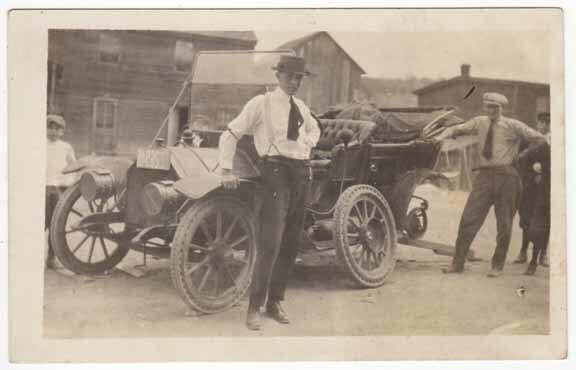 Model T Ford Forum: Forum 2012: So you think you know your tire pressure! Checked the pressure in the T's tires today and then thought I would check with a second gauge and got significantly different results. So I checked one tire with 5 different gauges. The rows are readings from each gauge shown, the columns are 3 different sets of readings on the same gauge. The range was 32 to 46 psi ..... not acceptable! So here's the question: What standard do you use to find out if your gauge is reading right ? The answer is not to buy another gauge because that one could be wrong too. I need to know how to check the accuracy. He used a calibrated standard found in aircraft maintenance shops. I've noticed the same thing. I chalked it up to el-cheapo tire gauges. You know, the $.99 ones on the counter at the parts store? I had one of those in each vehicle at one time, but got to noticing varying readings. I finally asked if they had a good quality 'professional' model at NAPA. What they showed me looked identical to the $.99 ones, but was $5 or $6. For all I know, it's inaccurate too, but so far, I've not had any clinchers shear their valve stems. The only way is to get your gauge tested by an approved testing authority who can adjust the gauge or provide a test sheet with the gauge reading and the actual test reading. The other way is to buy a gauge that has a test sheet with it. These are expensive. It has some nice features like rubber cover to reduce damage from drops, bleed valve, and a direct-to-compressor connection. It's not just tire gauges. I've tried the BP machine at the local Wal-Mart, then at a doctor's appointment ten minutes later and found my pressure was thirty pounds lower than what the machine claimed. The next time you drive down the main street of your town, compare all the various temperatures shown by the different time & temperature signs. Around here they always vary by at least five degrees, and usually more. Been using this for about 10 years. I consider it a "professional" model. No manf. name. Just says made in USA. Pressure is read from the glass window at the top. Oddly I have a Model A gauge and they coincide. I always suspected as much. Interesting to see a controlled test like that, Bud. Makes me wonder now - my pressure gauge didn't even cost .99 - it was a platic freebie from the tire store. 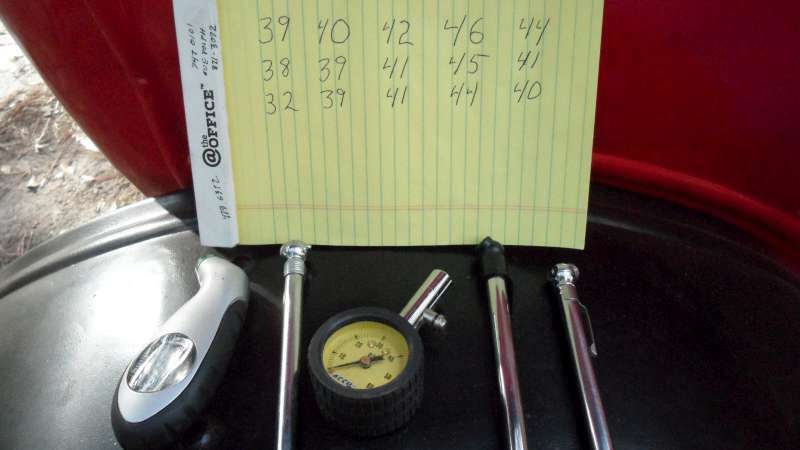 Using a tire pressure gauge test station like the one listed in the link below is one way to find out how accurate a tire pressure gauge is. Most if not all local tire vendors should have a test station and if one were to ask I bet they would let you check your gauge on their test station. So, what brand of tire pressure gauge is used by NASCAR? One would think they might want to use the best available, given the dire consequences if the tire pressure is wrong on a NASCAR racecar. Max, as I was typing my last little bit of stupidity I was actually thinking of the same question. What about guys that run 300 mph dragsters or funny cars. You'd think those guys would want to be a little fussy. I'm thinking of buying an old fashioned tire pump and some how fitting a 50 lb weight (approx) to the handle (might take a little wood framing to hold it). Measuring the ID of the cylinder, figuring the area and dividing that into the 50lbs should give a very accurate pressure source. If you could figure out a way to attach a normal valve stem to the output hose, I think it would be a very accurate calibration tool for a tire gauge. Comments? Anyone have a simpler idea ? Bud, learn what you can about force gauges and how to adapt one to your test procedure. I'm trying to remember what they're called in an electronics application. It some term that includes the word bridge and involve a layer of carbon on a piece of plastic that changes current when it's flexed and it's the basis for a force or stress gauge. We used to use them for calibrating and testing torque wrenches but they'd work good for your application. Heck maybe you could set up your own test lab. I bet Goober would know the answer to this question! Didn't I just prove that? I use a gauge used by dirt track racers. Very accurate! I do find that up here in the north, you really need to watch what time of day it is. I always check mine in the garage before I go so I know the temp is always pretty close to the same all the time. Mike -- You can stop with all that Bull stuff! It's validity has been proven over and over again by college students across the globe. It is used to prove that there is no difference between data sets. No for the T era part! As you may or may not know - it was developed by Mr William Sealy Gossett and originally published in 1908 - during the brass era. It was not called the Gossett test because his employer didn't want his competitors to know that he was using statistics to make his product consistent so it was named the Student T test. Most knowledgeable people of the time knew the truth and spent hours enjoying the product. But there were a few that didn't have a clue. Much like the folks that don't understand Model Ts. Today students around the world test the results of the Student T Test as they drink Guinness Beer. Some times they attempt to over test. When that happens the variability of their walk increases, their visits to the bathroom become more frequent, and the error of their aim gets the wall wet. Those stick gauges are all over the map, and dial gauges can be off by 10% depending on how cheap they are. It also has to do with the full scale rating of the dial gauge used. The percentage of accuracy is taken against the full scale...i.e. a 100 psi gauge at 3% accuracy will only be accurate to within a 3 pound range on any given trial. Gauges? We don't need no steenkin' gauges! Actually any of those gauges would be accurate enough for running the tires. The one on the left would be the one I'd throw out. The others are within one or 2 lbs variance on each reading. Most important things are to get enough pressure in the tire to keep it from running off the rim and keep same or close to same pressure in each tire to keep the car running in a straight line. When you test the pressure, you will find that usually a little air escapes when you press the gauge to the valve. That would account for the small variations. If you check the air on a cold morning, it will be lower than during a hot day. It will also vary by altitude, and running temperature as you drive along. If it were my car, I wouldn't worry about the variation. I just check before each tour and about once a month when I am at home and drive around once and a while. So far haven't had a significant problem. My INSA tires on the 26 Roadster are all over 20 years old and have not had a flat. The Bedford tires on the 26 Touring are over 10 years old and haven't had a flat tire. The Riverside tires on the 22 Roadster are 5 years old and have not had a flat. All the tires still have tread and no significant sidewall cracks. The cars are normally parked inside the garage unless on the road. I use a modern bicycle pump. It has a gage built in to it. 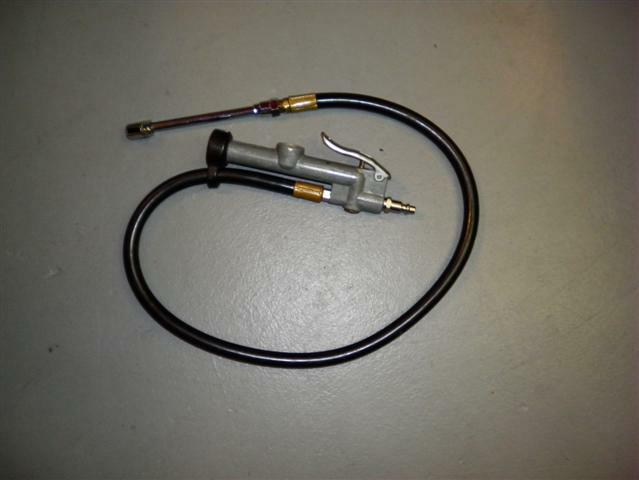 It is designed to pump up the high pressure tires on road bikes, that typically run 120 psi. It is easy to pump and the gage is accurate enough for my bikes and my model T. The gage is also easy to read. It was fairly inexpensive. I can pump up my tires in a few minutes by hand. Wouldn't that be X-bar +/- 3 SD for a total range of 6? That Autocar would have originally been equipped with tubeless tires. The photo was probably taken much later than 1899 when tubeless tires were no longer available. 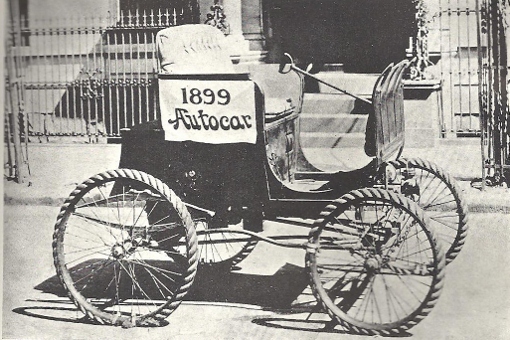 Owners and restorers of very early automobiles face the same dilemma regarding tubeless tires. Some install hard rubber tires on the original rims. Some swap the original rims with clinchers. A friend of my dad's welded clincher rims onto the original rims of his Baker Electric. Of course it's X-bar +/- 3 Sx (sample standard deviation) And a student T test tests validity of the averages but without the F test to test the validity of the variance. But none of it means squat if a chi square test isn't done first. Otherwise you may be dealing with something other than a normal distribution. And of course we're only talking samples here if we're using Sx. And that's why the chi square test is so damned important. But in our case our only opportunity is for sample std dev utilizing the formula of n(n-1). We need that kind of freedom if were going to project the any estimates that'll represent the population. But in this particular case we're talking gauge measurement repeatability and reproducibility. Though were looking at averages against the population estimates we don't want the measurement average to be any more than 10% of the population estimates as represented by Sx. But the purpose of this little bit of "statistical bull" is to get these people to understand their gages are not going to repeat any better then the natural variation of the gauge error will allow. Now I'm tired you guys. I'm old and retired and don't want to debate these facts. In reality I have no idea what the hell I'm talking about and this whole exercise in fertility has given me a headache. Leave me alone for awhile now. I'm ok now, I drank a cup of decalf and went outside for a minute. I'm pretty sure I'll be fine. There may be a little collateral damage in the left orb and my vision is a little blurred but I'll be all right. One symptom I feel I may have to deal with for a while is the shaking in my hand so if you see any erreaun, eroneou, erroneous typing that I wasn't able to catch because of the inept digits in my hands I apologize. It's just a slight case of neuropathic anomaly and I hope it's only temparery, temparary, temporary. Hey Mom, Mom, Mama, Mommy, I want my mommy! At least your not hearing voices inside your head .............or are you ?